If you follow me on my Zajac Interiors Facebook Page or Instagram you have been watching the daily progression of my own bathroom remodel. How do you feel about grout? I really hate grout in shower and bath areas because it’s an area that always needs attention. So, I wanted to try a Kohler product called Choreograph. It’s a solid surface system consisting of three pieces, one for each wall of the surround. You can customize it with all kinds of different pieces but I wanted something simple and modern looking. In my FB page you can see all the pictures but below I’ll put a few for you to peruse. I wanted to also document this process to show you what even a professional might run into when doing a remodel. Kohler product back ordered - I ordered the product in August and because of weather related issues (flood, fire, etc.) my product didn’t arrive until end of November. Getting on contractor’s schedule once product is in hand - People in the trades are extremely busy and waiting a couple of months to get on a schedule is not unheard of, so plan accordingly. I waited to get on my contractor’s schedule because I knew it would be worth it. And it was. Opening a plumbing wall to find a surprise - I try my best to manage client expectations especially in a kitchen or bathroom remodel. 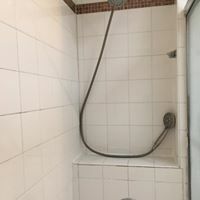 I’ve worked on enough bathroom and kitchen remodels in the Wekiva area where homes are 25 - 40 years old to find some unexpected surprises that have been behind the walls. This adds time and money to a project. There was a small plumbing leak to deal with in the bath area. It added a day onto the total time. In the end, I am very happy with the final product. It took 7 working days to finish (no work on the weekends). All I have left to do is to find some nice art work for over the toilet, a new toilet paper holder and some fun towels. Stay tuned for the final look. Please note that some of the items I post about contain affiliate links which means that I may get a small commission if you order online and my referral code at no cost to you. Grab Your FREE Guide - 3 Hot Tips to Design and Love Your Ideal Room! A Day in The Life of an Interior Designer - Is it Glamorous?